Property owners in the devastated lakes (Limnes) area of Pissouri are still waiting for the government to fulfil its promise to pay for sorting out the mess caused by land slippage in the area. DESPITE promise after promise from ministers and state officials, no measures have been taken to counter the land slippage that has caused the destruction of homes and roads in Limnes village Pissouri since 2012. In total, 60 properties with cracks in the walls as well as 14 houses and a complex of 28 apartments have all been seriously affected and owners are seeking support from the state, according to Georgia Elina Zoi, a lawyer who has taken up the case. The long-standing issue stems from land slippage in the area that the state is very much aware of. Mick Ellis, who bought his house in 2013, says the current situation is a disgrace. “No one’s doing anything about it, they’re still selling houses,” he said. None of the residents are seeking to battle it out in court, Zoi told the Sunday Mail. They just want the government to accept the landslide as a matter of natural disaster and help the affected people find a safe place to live. Four families have been evicted since 2012. When the problems first appeared, Aristo developments provided a few tenants who were staying in an apartment complex with a different place to stay. When it became obvious the problem was not just in the developer’s complex but throughout the area, it stopped, according to Zoi. Ellis, who used up his life savings to obtain the property he lives in, said “I have absolutely no desire to see anyone punished or go to jail. In his opinion, the government is reluctant to take any action because digging deep into the case might unearth short-comings. Member of the Pissouri community council Markos Foutas conceded that the area was declared a building zone in 1981 and procedures were not carried out in the same way they are today. Analysis of satellite images (InSAR data) revealed land slippage was happening as early as 2006 at around 2cm, according to Zoi. The effects did not become obvious until 2012. In December last year, fixed points in the ground were installed to monitor the movement which by March 8 had reached 10-18cm, she added. This all points towards asking the state to identify the affected area as a landslide area, compensate the affected residents for natural disaster and immediately take measures to avoid further expansion of the problem towards the village, Zoi said. The ordeal is costing them their health, he adds. Even electricity poles have moved because of the land slippage causing cables to stretch and tear. Although they were repaired, “we’re just winning time,” Foutas said. Cracks appear in the roads on a regular basis and through the district office tries to stay on top of it, that doesn’t solve the problem, he added. The interior ministry did not respond to request for a comment for the Sunday Mail. Residents in the meanwhile are doing all they can. Since July 2015, several property owners grouped together to form the Pissouri Housing Initiative Group (PHIG). The group is chaired by Peter Fields. He and his wife have been evicted from their home after it was declared unsafe. Photographs make it obvious why. A twitter account @Fight4Pissouri has also been created trying to garner enough attention for a solution to be found. In 2015, former Interior Minister Socrates Hasikos had announced plans to put measures in place that could resolve the problem. These included expanding projects designed to channel rainwater away from the area. New wells were also set to be drilled to monitor the underground water. The cost, quoted at €20m, was going to be paid for by the government. Nothing materialised and then the government changed its mind, saying the fault lay with the contractors who had, for instance, used inadequate filling-in works. According to Zoi this was nothing but a ploy as the engineers who designed the homes over 20 years ago are either retired or dead. 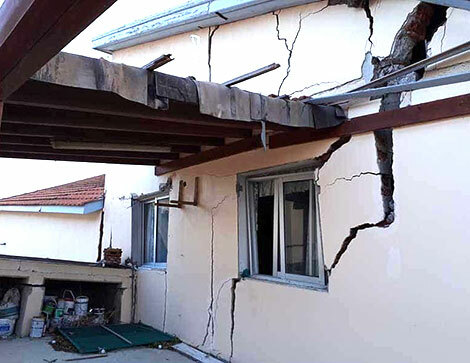 In June last year, British High Commissioner Matthew Kidd visited the area to see the damage for himself and try and intercede with Interior Minister Constantinos Petrides. On Thursday, however, a meeting at the presidential palace took place between the director of the president’s office Petros Demetriou, members of the Pissouri community council and Zoi, representing the residents. “It’s our last card,” Foutas said. “We are very happy with the meeting,” said Zoi before adding: “I am hesitant to be too optimistic.” Experience has shown her otherwise. During the meeting, the council showed Demetriou a presentation showcasing the extent of the problem. “We were told that (Demetriou) needed a few days to speak with the respective government departments and then prepare a memo to show the president,” Zoi said. During the meeting, two requests were made, Foutas specified. Firstly, that the government should begin projects to resolve the issue as it had pledged in 2015. “Several studies have been carried out,” and it’s time for action, he said. In the past three years, the properties have deteriorated drastically and there are fears the measures promised by the government at the time will not now be enough. The second request is that affected residents should be compensated with a safe place to live, starting with the more serious cases. First, there are the families who have been evicted – their homes precariously dangerous – residences that have some problems and properties which have yet to demonstrate issues, but it is just a matter of time. They should be helped in that order, Foutas said. “Meeting government officials is a start – but it has taken over four years to get here. Maybe they did not push it before but now the damage is widespread it cannot be ignored,” said Ellis. Fields, who rents an apartment with his wife since his eviction, said he visits his home to look after the garden only to find equipment has been stolen. ……and over all these years Nobody – builders, surveyors, Councils, Government departments, GOVERNMENT……seem to have done anything about it. Yes we have deep sympathy for those people, families who have been Completely LET DOWN – with, it seems, those in the Building and Construction industries, Government, local and National simply batting the problem around, no-one taking Action. Shame on Cyprus – and All who have contributed to the creation of this horrendous situation. Why wont people just accept that the government are just playing the waiting game as usual. It will just keep getting swept under the carpet until everybody has used their own money and can not financially afford to pursue the matter any further. If the government accept any sort of responsibility it would open the floodgates to hundreds of other developments making claims. People are committing financial suicide chasing this claim. In another 20 years nature will do its bit and the land will be swallowed up.